I’m still wearing my battered and laddered and grimy satin slippers. I CAN’T SEW MY CANVAS SHOES. The backs keep slipping off my heels, which is a pain in the arse and also makes me feel like I’m going to go flying every time I attempt any turn. I have to pull them down when I’m waiting to go across the floor which is about as elegant as picking your leotard out of your bum. This problem could be rectified if canvas slippers, like satin ones, came with elastics you could sew on yourself. Do people really hate sewing that much? Do they retain it on satin slippers cos it’s somehow olde worlde dainty ballerina? 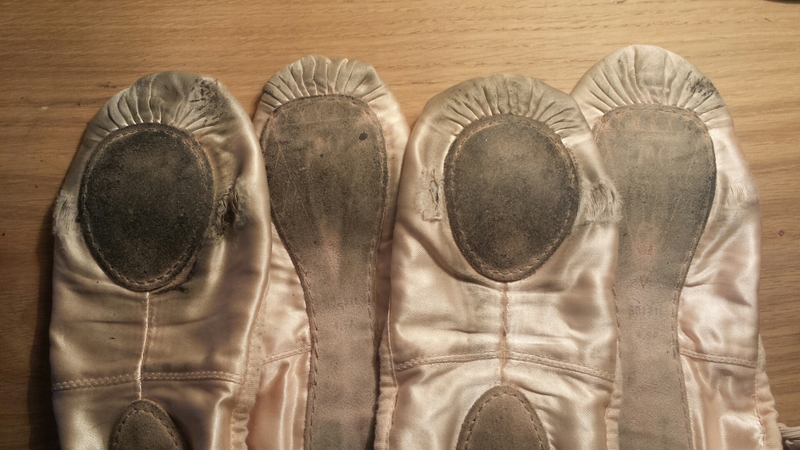 I would have thought people were used to having to sew elastics and anyway everyone needs to do it for pointe shoes. So why just bang them on canvas slippers when everyone needs to adjust their shoes slightly for their own feet? Sorry for all the CAPS but it’s driving me mad. I love sewing and I love the fact I can fit my shoes to my feet perfectly. I also loved the line the canvas shoes, which were Bloch’s fancy-fancy stretch ones, gave my feet. Back to lovely satin slippers. I’m well overdue for a shiny new pair!